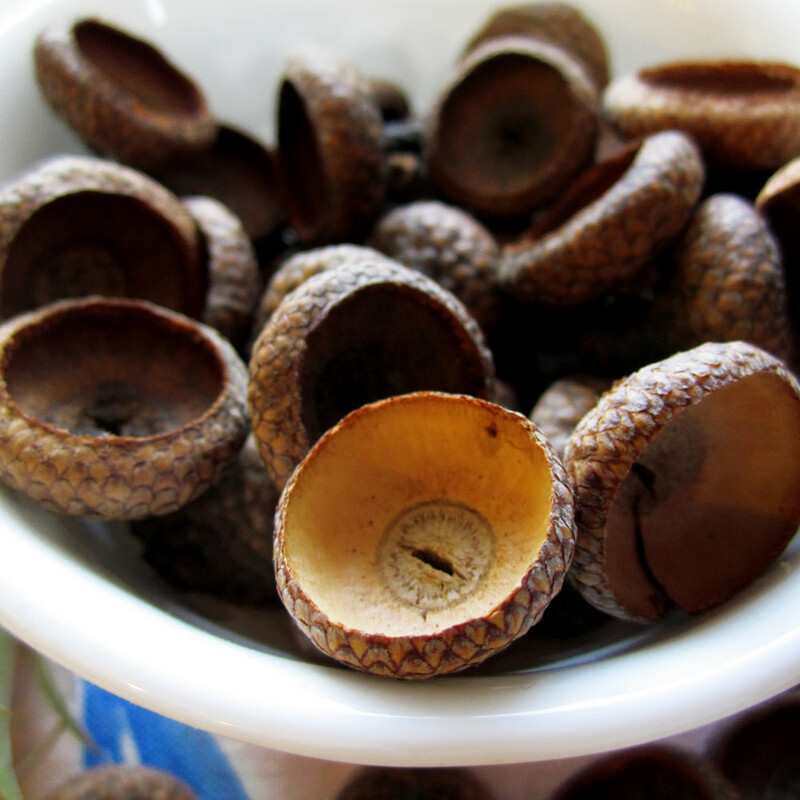 Pick over your collection of acorn caps and discard any cracked or damaged ones. Make sure that they’re clean and completely dry before you use them for this project. Now… on to the waxy melty part! 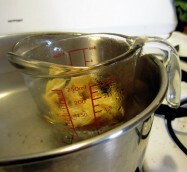 To heat the wax, I fill a sauce pan with 2-3 inches of warm water and put my measuring cup in the warm water bath. Now, there are a few things to keep in mind. You want to heat the water to just before it breaks into a full simmer. Think hot water, not boiling water. You also want to keep all water out of your wax! 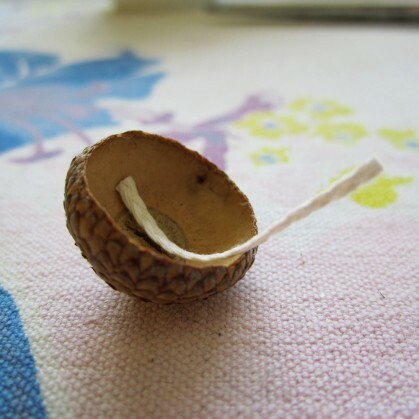 Because weâ€™re pouring wax into a vessel, water in the wax could get trapped next to the acorn cap and create air pockets, rot the cap or other mayhem I donâ€™t even want to think about. So, back to the measuring cup. 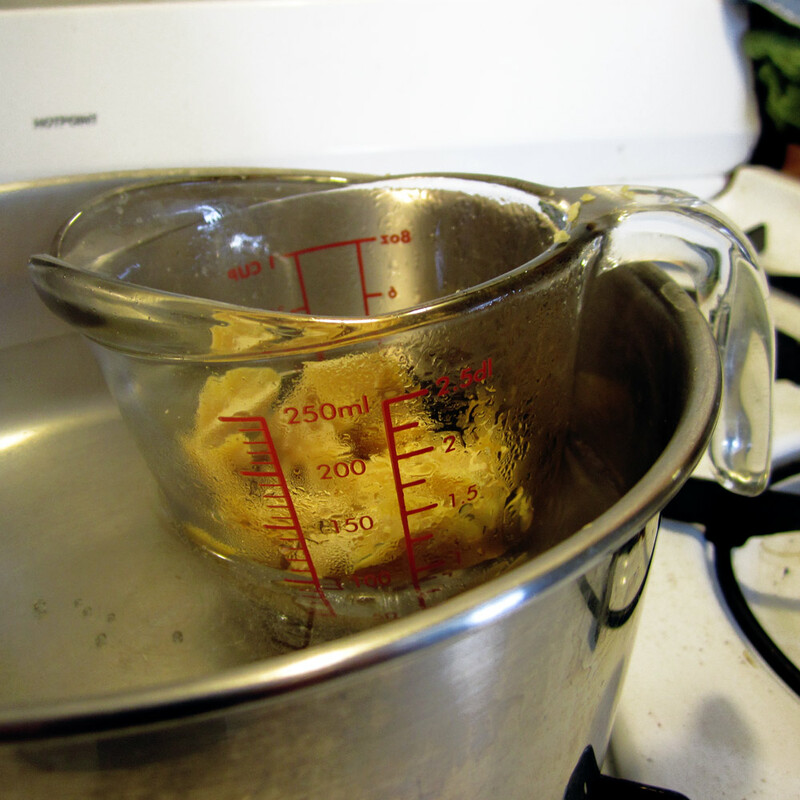 Put your measuring cup in the hot water bath and hook the handle over the side of the pot. This will keep your handle cool and dry and make it easy to lift the measuring cup out when youâ€™re ready to pour. Check on your wax every few minutes to break up larger chunks as it starts to melt and add water to the water bath as it evaporates. 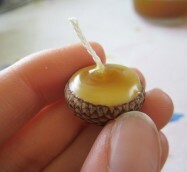 While your wax is melting cut your wicks into Â½ inch pieces. You can always make them longer and trim off the excess later. I like to lay my wicks in each cap ahead of time, especially since youâ€™ll have a bit of time while you wait for your wax to liquefy and it makes it easier to just pick up a cap and pour instead of spending time to fiddling with each wick while you juggle hot things. Now, your wax is completely melted. Pick up the first cap and wick set with two fingers. 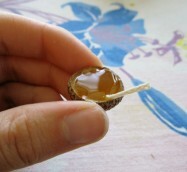 Carefully pour the wax into the cap until it is full to the brim and return your measuring cup to the hot water bath. 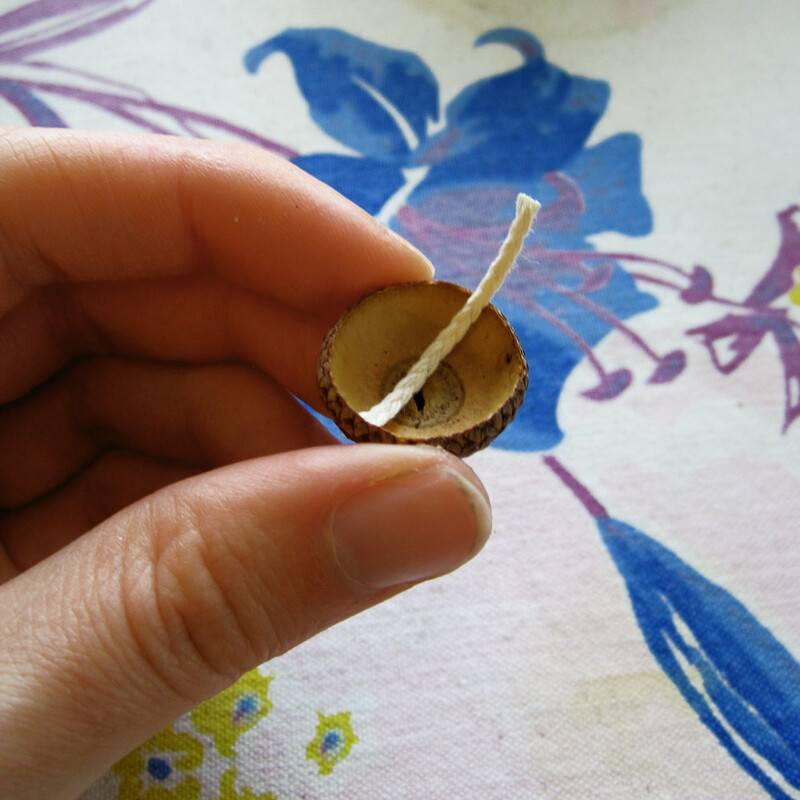 While holding the cap between two fingers, gently blow on the wax-filled acorn cap to speed up the cool process but not hard enough to blow hot wax out of the shell and onto your fingers. 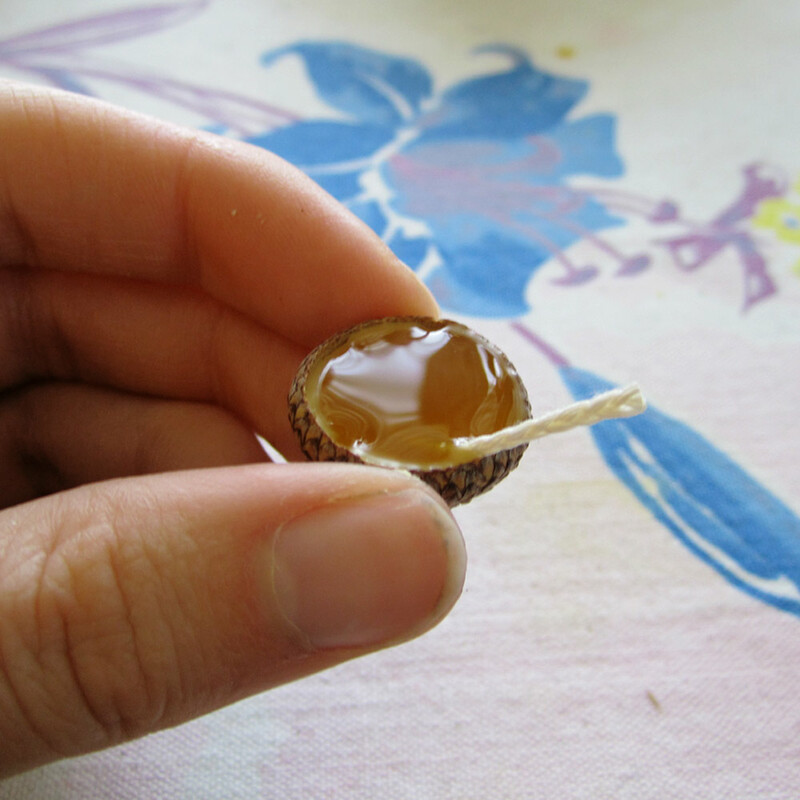 Once the wax develops a pale ring around the edges of the cap, your wax has started to cool. 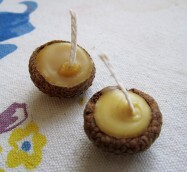 Using the thumb and forefinger of your free hand, grasp the free end of the wick to hold the wick vertically in the center of your candle while you continue to gently blow over the surface of the wax. 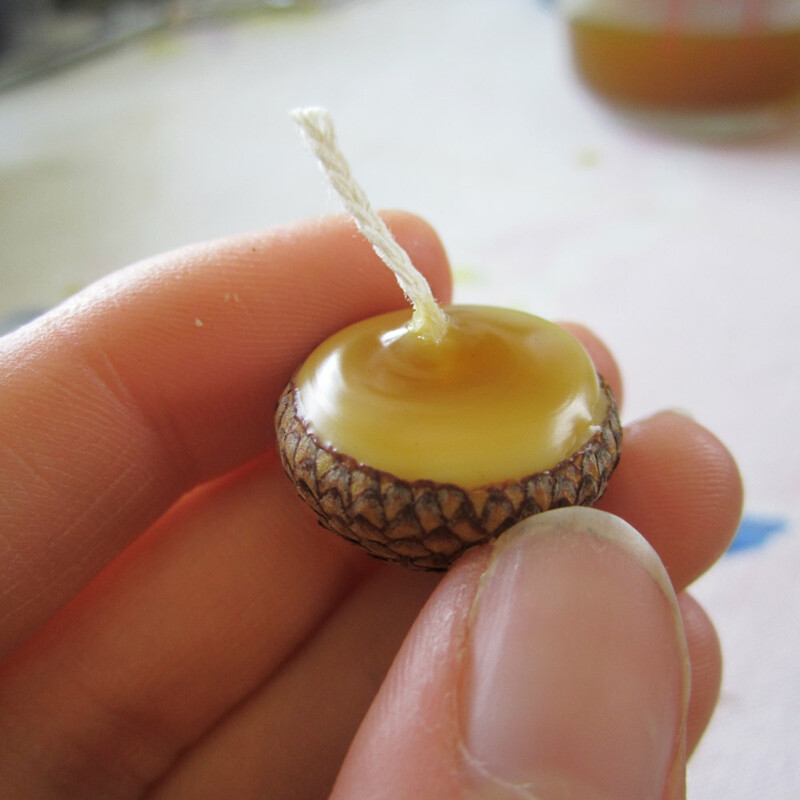 Once the beeswax develops a skin and turns opaque you can set your acorn down on your work surface and move on to the next candle. 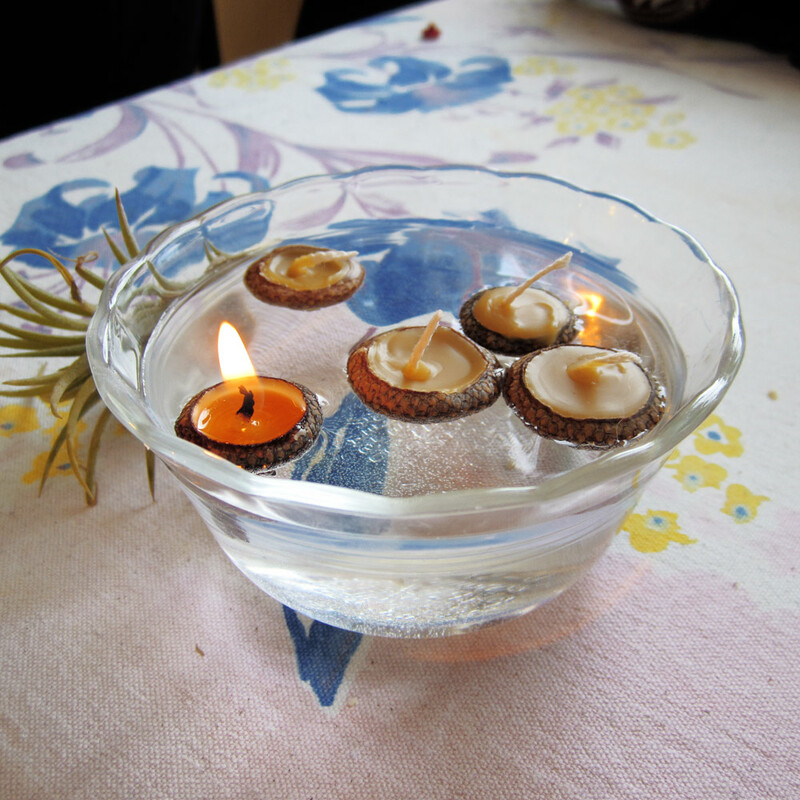 Because these candles do not have a flat bottom, they may only be used safely if they are floating in water. 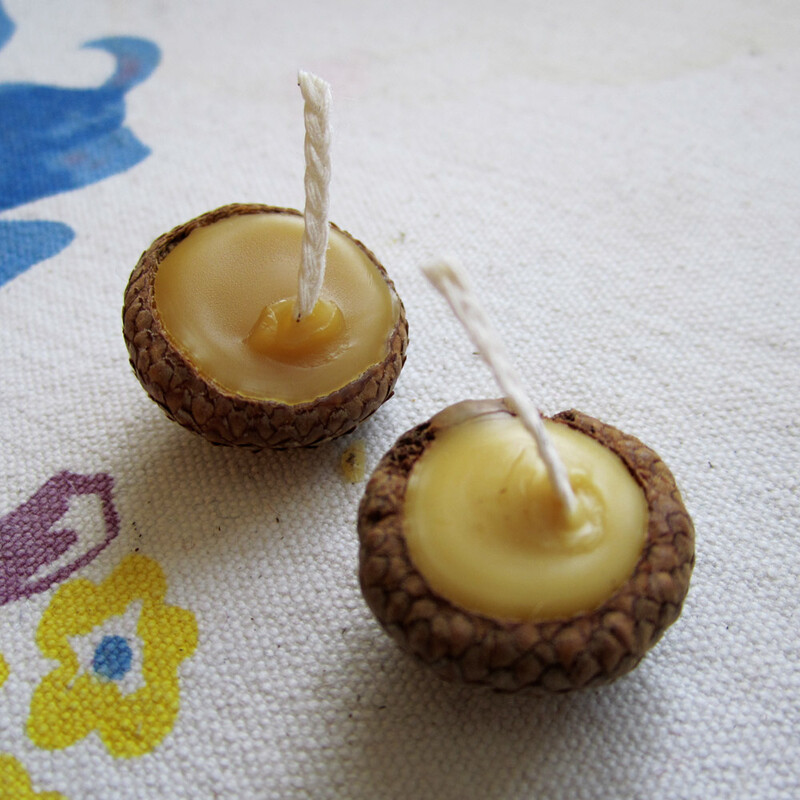 When your wax is cool and you’re ready to test out your little flotilla of fairy candles, gently lower them cap-first, into a small container of water. 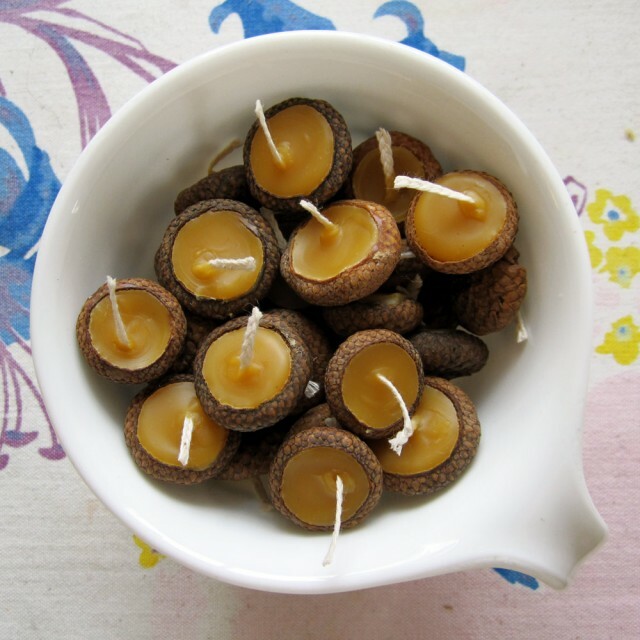 Make sure to keep the wax and wicks dry or your candles will not light properly. Each acorn cap should burn for about 15 minutes. 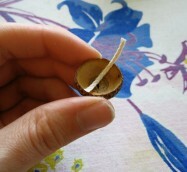 You’ll know it’s time to blow them out when you hear a cheery crackling-logs-sort-of-sound as the shell starts to burn. Enjoy your happy little candles! 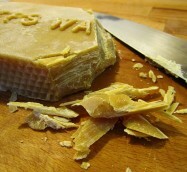 Try to buy beeswax from a local apiary. 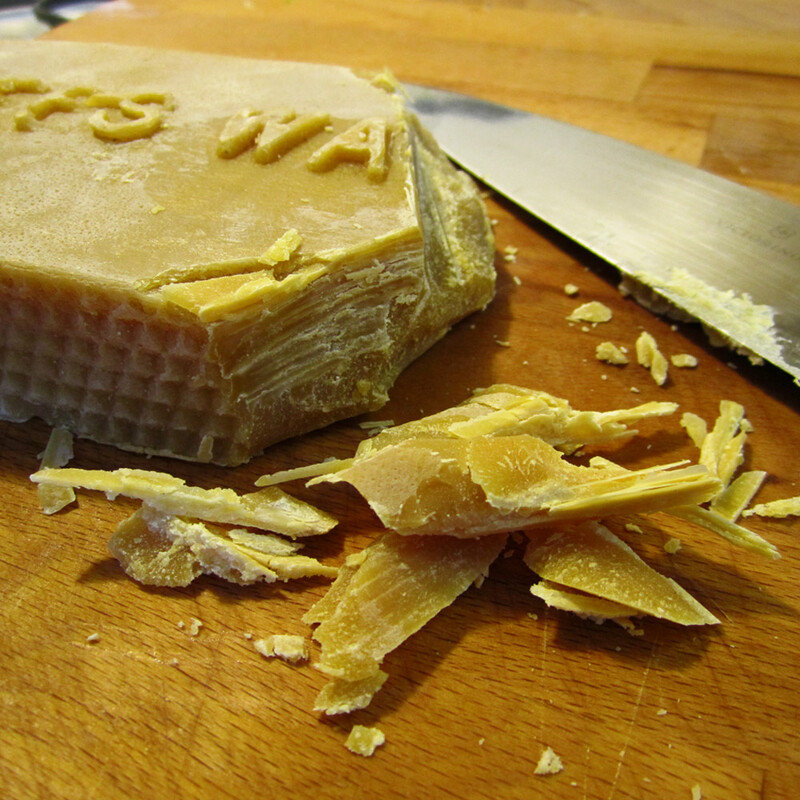 You're supporting the local bee-conomy and you can see exactly where your wax is coming from. You can find a list of apiaries/beekeepers near you here.